When I was a little kid ,the next day of Eid ul Adha ,there had always been a Eid get together party either at our place or at one of my Uncle’s place ( my father’s friend) . At uncle’s place the special items on the menu had always been “Bhuna khichuri” and “Achari gosht” . I can never forget that taste . 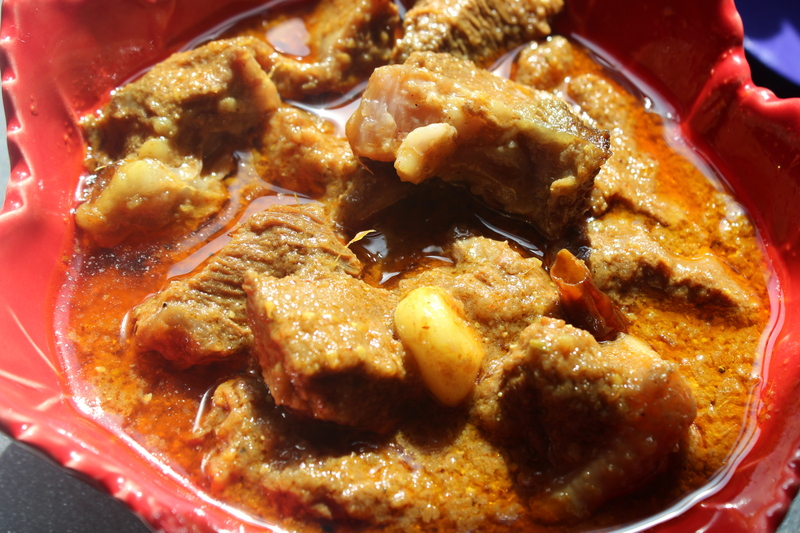 That beautiful golden color of the meat curry with unforgettable achari flavor . For the flavor , that aunt always used to use her homemade mango or olive pickles . I don’t know which of the spices she used to put in but one thing I know so correct for sure , there is no use of garam masalas ( Cinnamon, cardamom, bayleaf , clove and black pepper) , either whole or grounded . Only the spices , that are used for making pickle should be used . Crush all the ingredients together into a coarse powder ( it must not be fine). Don’t dry roast anything except cumin . 1. Mix the onion , ginger , garlic paste with the meat . Now heat the oil and add the meat with the marinade . Cook on medium low flame with lid on . The meat will release water and will cook on it’s own water . The meat need to be cooked on medium low flame and the lid must be on . 2. After 40 minutes , the meat is half done , add the turmeric , chili powder . The reason behind adding it now is to maintain that golden bright color . In the mean time before adding chili-turmeric powder , if you need , you may add little water too if you think it may get burnt at the bottom as the gravy dried out too much . Add little water and salt . Cook little while , then add the final water . Not too much and cover the lid and cook for another 20- 30 minutes or until the meat is tender . 3. Add the Whole garlic and the pickles . Add 1/2 tbl spoon achari moshla and mustard oil . Add the dried split red chilies .Now simmer the meat another 10-15 minutes on low flame with lid on . 2. be careful about the using of salt . The pickles have salt too . So don’t add too much salt while cooking the meat . This entry was posted in Glossary / Notes and tagged achar mangsho, achari beef, achari gosht, Achari mangsho, achari mutton. Bookmark the permalink.